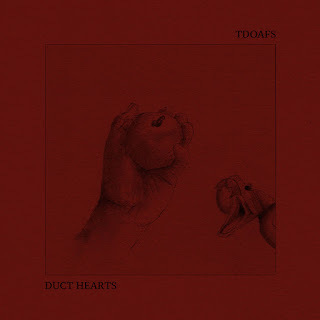 This Noise Is Ours: Tdoafs/Duct Hearts - Split 6"
I've managed to drag myself away from an article published by a considerably bigger music site than mine, and the eschewing fallout in the comments thread to string a review together this evening. I'll return to witness the rest later! Here's a new split between Canadian trio Tdoafs and their German counterparts Duct Hearts. They've taken the more unusual route of releasing this split on a 6" record, with no less than nine labels collaborating to make the physical finished product happen. Many of you reading this will know that I've talked about Duct Hearts more than a few times now, but Tdoafs are new to me so this should be a lot of fun. As this is a 6” record, the songs from both bands are relatively brief. Tdoafs begin with Kids, which is a relatively lo-fi but ear-friendly song making the best use of both their melodic screamo and the formats limitations. The fact that the trio seem to all be providing vocals makes it even cooler. I’m sure I’ve said in a previous review recently how much I like the flourishing Canadian metal/punk scenes at the moment. Tdoafs just proves that my point further. Duct Hearts very much pick up where they left off with “Feathers” on Enduring War. The mix of soaring melodic guitar and clean vocals, often joined by brief heaviness is a very different proposition to the sound of their split-mates, but it again demonstrates that they’re really maturing as a band. The raw energy of Tdoafs set against the more considered approach of Duct Hearts makes this short split a great listen. I just wish there were more songs to get my ears wrapped around.